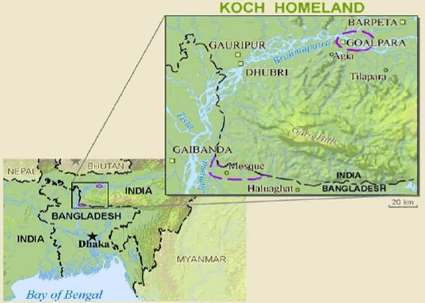 The Koch of Bangladesh live in a small pocket of land along the Indian border in northwestern Dhaka division. 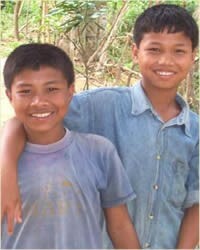 These Koch speak a Tibeto-Burman language, and this distinguishes them from a much larger group of Koch (sometimes spelled Cooch) who speak an Indo-Aryan language. Within Bangladesh the Tibeto- Burman Koch generally continue to follow their traditional "Sonaton" religion, though some say they are Hindu. Most of the Indo-Aryan Koch speakers in Bangladesh have embraced Islam. Among the Tibeto-Burman Koch there are two groups in Bangladesh: the Tintekiya and the Chapra. The Titekiya, whose name means "three pieces of clothing" and comes from their traditional dress, live in about 19 villages. The Chapra live in only three villages, and in each they are the minority. Both the Tintekiya and the Chapra Koch are primarily farmers, with some farming their own land and most working as hired day laborers for neighboring Bengalis. They continue to live primarily in Koch villages in simple homes with mud walls and floors and thatched or corrugated tin roofs. There are also some Koch living in Gazipur near Dhaka. These people's ancestors apparently spoke a Tibeto-Burman variety of Koch, but today these people speak Bangla as their mother tongue. They have little or no communication with the Koch living in northwesterern Dhaka division, but they do still share some cultural traits. Most of these Koch, too, are Sonaton, but possibly one or two families say they are Christian. The Koch are poor and uneducated. A Christian education and/or community development organization could possibly be a real blessing to the Koch. At the same time, it seems the Koch tend to equate Christianity with opportunities for education and health care and are in great need of someone to share true Christianity with them. View Koch (Hindu traditions) in all countries.